Diamagnetism is the property of an object or material which causes it to create a magnetic field in opposition to an externally applied magnetic field. Unlike a ferromagnet, a diamagnet is not a permanent magnet. Diamagnetism is believed to be due to quantum mechanics (and is understood in terms of Landau levels) and occurs because the external field alters the orbital velocity of electrons around their nuclei, thus changing the magnetic dipole moment. According to Lenz's law, the field of these electrons will oppose the magnetic field changes provided by the applied field. The magnetic permeability of diamagnets is less than (a relative permeability less than 1). In most materials diamagnetism is a weak effect, but in a superconductor a strong quantum effect repels the magnetic field entirely, apart from a thin layer at the surface. Diamagnets were first discovered when Sebald Justinus Brugmans observed in 1778 that bismuth and antimony were repelled by magnetic fields. The term diamagnetism was coined by Michael Faraday in September 1845, when he realized that every material responded (in either a diamagnetic or paramagnetic way) to an applied magnetic field. Diamagnetism, to a greater or lesser degree, is a property of all materials and will always make a weak contribution to the material's response to a magnetic field. However, for materials that show some other form of magnetism (such as ferromagnetism or paramagnetism), the diamagnetic contribution becomes negligible. Substances that mostly display diamagnetic behaviour are termed diamagnetic materials, or diamagnets. 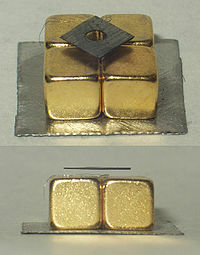 Materials that are said to be diamagnetic are those that are usually considered by non-physicists to be non-magnetic, and include water, wood, most organic compounds such as petroleum and some plastics, and many metals including copper, particularly the heavy ones with many core electrons, such as mercury, gold and bismuth. The magnetic susceptibility of various molecular fragments are called Pascal's constants. Diamagnetic materials have a relative magnetic permeability that is less than or equal to 1, and therefore a magnetic susceptibility which is less than 0 since susceptibility is defined as χv = μv − 1. This means that diamagnetic materials are repelled by magnetic fields. However, since diamagnetism is such a weak property its effects are not observable in everyday life. For example, the magnetic susceptibility of diamagnets such as water is χv = −9.05×10−6. The most strongly diamagnetic material is bismuth, χv = −1.66×10−4, although pyrolytic carbon may have a susceptibility of χv = −4.00×10−4 in one plane. Nevertheless, these values are orders of magnitudes smaller than the magnetism exhibited by paramagnets and ferromagnets. Note that because χv is derived from the ratio of the internal magnetic field to the applied field, it is a dimensionless value. All conductors exhibit an effective diamagnetism when they experience a changing magnetic field. The Lorentz force on electrons causes them to circulate around forming eddy currents. The eddy currents then produce an induced magnetic field which opposes the applied field, resisting the conductor's motion. Superconductors may be considered to be perfect diamagnets (χv = −1), since they expel all fields (except in a thin surface layer) due to the Meissner effect. However this effect is not due to eddy currents, as in ordinary diamagnetic materials (see the article on superconductivity). When a material is put in a magnetic field, the electrons circling the nucleus will experience, in addition to their Coulomb attraction to the nucleus, a Lorentz force from the magnetic field. Depending on which direction the electron is orbiting, this force may increase the centripetal force on the electrons, pulling them in towards the nucleus, or it may decrease the force, pulling them away from the nucleus. This effect systematically increases the orbital magnetic moments that were aligned opposite the field, and decreases the ones aligned parallel to the field (in accordance with Lenz's law). This results in a small bulk magnetic moment, with an opposite direction to the applied field. Note that this description is meant only as an heuristic; a proper understanding requires a quantum-mechanical description. Note that all materials undergo this orbital response. However, in paramagnetic and ferromagnetic substances, the diamagnetic effect is overwhelmed by the much stronger effects caused by the unpaired electrons. 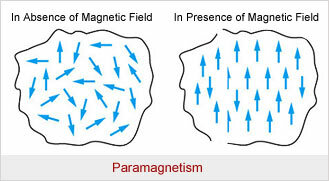 Paramagnetism is a form of magnetism whereby the paramagnetic material is only attracted when in the presence of an externally applied magnetic field. In contrast with this behavior, diamagnetic materials are repelled by magnetic fields. 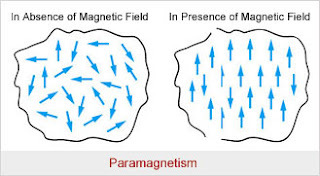 Paramagnetic materials have a relative magnetic permeability greater or equal to unity (i.e., a positive magnetic susceptibility) and hence are attracted to magnetic fields. The magnetic moment induced by the applied field is linear in the field strength and rather weak. It typically requires a sensitive analytical balance to detect the effect and modern measurements on paramagnetic materials are often conducted with a SQUID magnetometer. Paramagnetic materials have a small, positive susceptibility to magnetic fields. These materials are slightly attracted by a magnetic field and the material does not retain the magnetic properties when the external field is removed. Paramagnetic properties are due to the presence of some unpaired electrons, and from the realignment of the electron paths caused by the external magnetic field. Paramagnetic materials include magnesium, molybdenum, lithium, and tantalum. Unlike ferromagnets, paramagnets do not retain any magnetization in the absence of an externally applied magnetic field, because thermal motion randomizes the spin orientations. Some paramagnetic materials retain spin disorder at absolute zero, meaning they are paramagnetic in the ground state. Thus the total magnetization drops to zero when the applied field is removed. Even in the presence of the field there is only a small induced magnetization because only a small fraction of the spins will be oriented by the field. This fraction is proportional to the field strength and this explains the linear dependency. The attraction experienced by ferromagnetic materials is non-linear and much stronger, so that it is easily observed, for instance, by the attraction between a refrigerator magnet and the iron of the refrigerator itself. In a paramagnetic material there are unpaired electrons, i.e. atomic or molecular orbitals with exactly one electron in them. While paired electrons are required by the Pauli exclusion principle to have their intrinsic ('spin') magnetic moments pointing in opposite directions, causing their magnetic fields to cancel out, an unpaired electron is free to align its magnetic moment in any direction. When an external magnetic field is applied, these magnetic moments will tend to align themselves in the same direction as the applied field, thus reinforcing it. Ferromagnetism is the basic mechanism by which certain materials (such as iron) form permanent magnets, or are attracted to magnets. In physics, several different types of magnetism are distinguished. Ferromagnetism (including ferrimagnetism) is the strongest type; it is the only type that creates forces strong enough to be felt, and is responsible for the common phenomena of magnetism encountered in everyday life. Other substances respond weakly to magnetic fields with two other types of magnetism, paramagnetism and diamagnetism, but the forces are so weak that they can only be detected by sensitive instruments in a laboratory. An everyday example of ferromagnetism is a refrigerator magnet used to hold notes on a refrigerator door. The attraction between a magnet and ferromagnetic material is "the quality of magnetism first apparent to the ancient world, and to us today". Permanent magnets (materials that can be magnetized by an external magnetic field and remain magnetized after the external field is removed) are either ferromagnetic or ferrimagnetic, as are other materials that are noticeably attracted to them. Only a few substances are ferromagnetic; the common ones are iron, nickel, cobalt and most of their alloys, some compounds of rare earth metals, and a few naturally-occurring minerals such as lodestone. Ferromagnetism is very important in industry and modern technology, and is the basis for many electrical and electromechanical devices such as electromagnets, electric motors, generators, transformers, and magnetic storage such as tape recorders, and hard disks. A ferromagnet, like a paramagnetic substance, has unpaired electrons. However, in addition to the electrons' intrinsic magnetic moment's tendency to be parallel to an applied field, there is also in these materials a tendency for these magnetic moments to orient parallel to each other to maintain a lowered-energy state. Thus, even when the applied field is removed, the electrons in the material maintain a parallel orientation. Every ferromagnetic substance has its own individual temperature, called the Curie temperature, or Curie point, above which it loses its ferromagnetic properties. This is because the thermal tendency to disorder overwhelms the energy-lowering due to ferromagnetic order. Some well-known ferromagnetic materials that exhibit easily detectable magnetic properties (to form magnets) are nickel, iron, cobalt, gadolinium and their alloys. The magnetic moment of atoms in a ferromagnetic material cause them to behave something like tiny permanent magnets. They stick together and align themselves into small regions of more or less uniform alignment called magnetic domains or Weiss domains. Magnetic domains can be observed with a magnetic force microscope to reveal magnetic domain boundaries that resemble white lines in the sketch. There are many scientific experiments that can physically show magnetic fields. When a domain contains too many molecules, it becomes unstable and divides into two domains aligned in opposite directions so that they stick together more stably as shown at the right. When exposed to a magnetic field, the domain boundaries move so that the domains aligned with the magnetic field grow and dominate the structure as shown at the left. When the magnetizing field is removed, the domains may not return to an unmagnetized state. This results in the ferromagnetic material's being magnetized, forming a permanent magnet. When magnetized strongly enough that the prevailing domain overruns all others to result in only one single domain, the material is magnetically saturated. When a magnetized ferromagnetic material is heated to the Curie point temperature, the molecules are agitated to the point that the magnetic domains lose the organization and the magnetic properties they cause cease. When the material is cooled, this domain alignment structure spontaneously returns, in a manner roughly analogous to how a liquid can freeze into a crystalline solid. In an antiferromagnet, unlike a ferromagnet, there is a tendency for the intrinsic magnetic moments of neighboring valence electrons to point in opposite directions. When all atoms are arranged in a substance so that each neighbor is 'anti-aligned', the substance is antiferromagnetic. Antiferromagnets have a zero net magnetic moment, meaning no field is produced by them. Antiferromagnets are less common compared to the other types of behaviors, and are mostly observed at low temperatures. In varying temperatures, antiferromagnets can be seen to exhibit diamagnetic and ferrimagnetic properties. In some materials, neighboring electrons want to point in opposite directions, but there is no geometrical arrangement in which each pair of neighbors is anti-aligned. This is called a spin glass, and is an example of geometrical frustration. 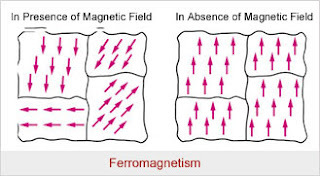 Like ferromagnetism, ferrimagnets retain their magnetization in the absence of a field. However, like antiferromagnets, neighboring pairs of electron spins like to point in opposite directions. These two properties are not contradictory, because in the optimal geometrical arrangement, there is more magnetic moment from the sublattice of electrons that point in one direction, than from the sublattice that points in the opposite direction. Most ferrites are ferrimagnetic. The first discovered magnetic substance, magnetite, is a ferrite and was originally believed to be a ferromagnet; Louis Néel disproved this, however, after discovering ferrimagnetism. When a ferromagnet or ferrimagnet is sufficiently small, it acts like a single magnetic spin that is subject to Brownian motion. Its response to a magnetic field is qualitatively similar to the response of a paramagnet, but much larger. An electromagnet is a type of magnet whose magnetism is produced by the flow of electric current. The magnetic field disappears when the current ceases. Electromagnets attracts paper clips when current is applied creating a magnetic field. The electromagnet loses them when current and magnetic field are removed. تعتبر الحشرات من المشكلات المعاصرة التي يعاني منها أي إنسان بالعالم، ونجد أن معظم المواطنين يلجئون إلى شراء المبيدات الحشرية المتداول بيعها في الأسواق، ولكن في النهاية لا تؤتي هذه المبيدات أي نفعاً، ولكن لا داعي للقلق لأن شركات مكافحة حشرات بالدمام تقدم أقوى العروض في مكافحة الحشرات فالشركة تقدم خدمة القضاء على كل أنواع الحشرات وكل هذا بأسعار رخيصة جداً لذلك بادروا الآن للتعاون معنا دون أي تفكير. شركات تنظيف بالدمام هي من أفضل وأكبر المؤسسات التي ظهرت في الآونة الأخيرة في مجال التنظيف، فنجد أن الكثير من ربات البيوت يبحثون عن شركة ذات كفاءة وخبرة في تنظيف الشقق، لذلك عند التعاون مع شركة تنظيف بالدمام لا داعي للقلق أو الخوف لأننا نقدم خدمة شاملة متكاملة من كافة الجوانب فمعنا لن تكون في حاجة أي شخص أخر لأننا نوفر لك كل ما تتمناه وأكثر وكل هذا بأسعار رخيصة جداً من الصعب أن تجدها في مكان أخر لذلك نحن متميزون دائماً. Thanks for posting the useful information. Manasmicro is best Ultrasonic flow meter and ultrasonic water flow meter supplier in pune India. What are the primary elements used for flow measurement ?